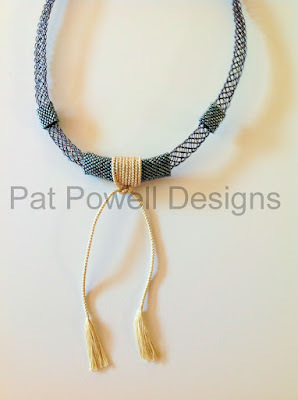 I have been so busy with my botanical printing I almost forgot a favorite pastime: kumihimo. The last several braids I have done were with wire. I do love these and the challenges they present. I have some ideas for additional designs but, every now and then it is good to return to the traditional: braiding with silk. This one is titled ‘Rose’. Ir does remind me of the roses with the deep green leaves and the vibrant deep pink flowers. 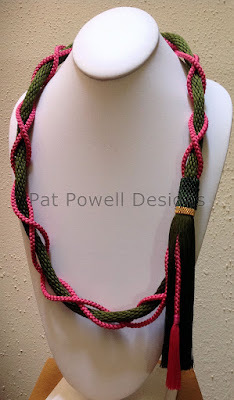 So now with the CHT (Contemporary Handweavers of Texas) conference coming up in a year it is time to get started on making more braids to consider for entry into the member’s exhibit. Hope to have both silk and wire for submission.